, an eminent mathematician, and professor of mathematics in the university of Edinburgh, was the son of the reverend Mr. Dugald Stewart, minister of Rothsay in the Isle of Bute, and was born at that place in 1717. After having finished his course at the grammar school, being intended by his father for the church, he was sent to the university of Glasgow, and was entered there as a student in 1734. His academical studies were prosecuted with diligence and success; and he uas particularly distinguished by the friendship of Dr. | Hutcheson, and Dr. Simson the celebrated geometrician, under whom he made great progress in that science. 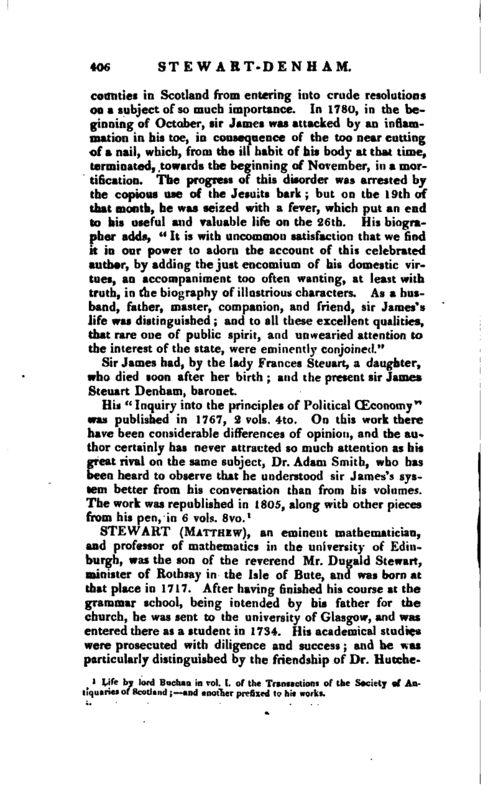 Mr. Stewart’s views made it necessary for him to attend the lectures in the university of Edinburgh in 1741; and that his mathematical studies might suffer no interruption, he was introduced by Dr. Simson to Mr. Maclaurin, who was then teaching with so much success both the geometry and the philosophy of Newton, and under whom Mr. Stewart made that proficiency which was to be expected from the abilities of such a pupil, directed by those of so great a master. Eut the modern analysis, even when thus powerfully recommended, was not able to withdraw his attention, from the relish of the ancient geometry, which he had imbibed under Dr. Simson. 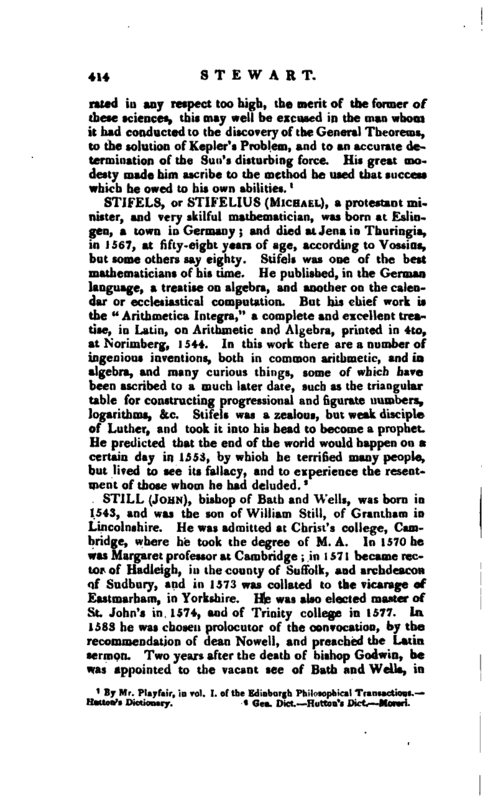 He still kept up a regular correspondence with this gentleman, giving him an account of his progress, and of his discoveries in geometry, which were now both numerous and important, and receiving in return many curious communications with respect to the Loci Plani, and the Porisms of Euclid. 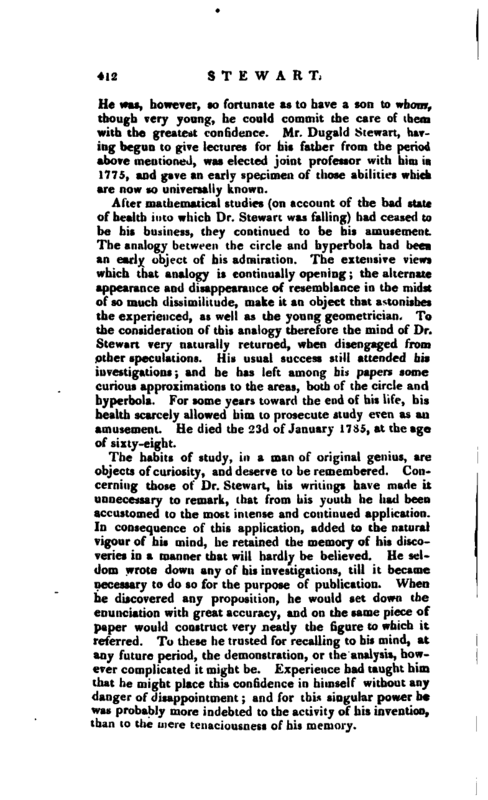 Mr. Stewart pursued this latter subject in a different, and new direction, and was led to the discovery of those curious and interesting propositions, which were published, under the title of “General Theorems,” in 1746, which, although given without the demonstrations, placed their discoverer at once among the geometricians of the first rank. They are, for the most part, Porisms, though Mr. Stewart, careful not to anticipate the discoveries of his friend, gave them only the name of Theorems. While engaged in them, Mr. Stewart had entered into the church, and become minister of Roseneath. It was in that retired and romantic situation, that he discovered the greater part of those theorems. In the summer of 1746, the mathematical chair in the university of Edinburgh became vacant, by the death of Mr. Maclaurin. 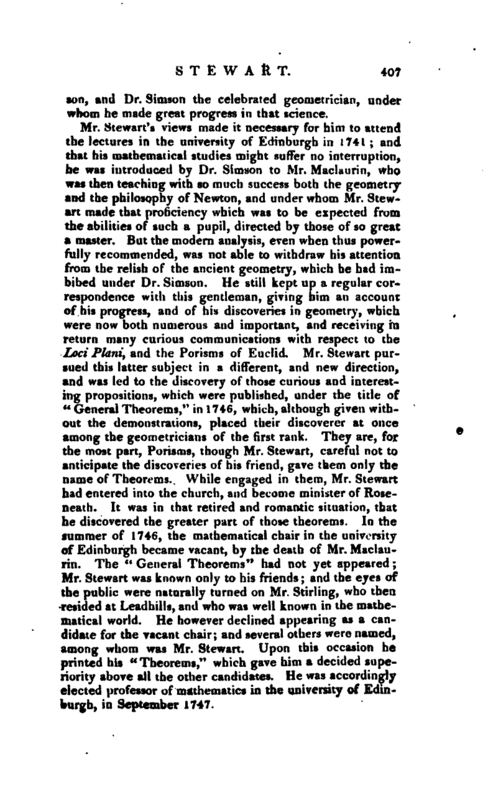 The “General Theorems” had not yet appeared; Mr. Stewart was known only to his friends; and the eyes of the public were naturally turned on Mr. Stirling, who then resided at Leadhills, and who was well known in the mathematical world. He however declined appearing as a candidate for the vacant chair; and several others were named, among whom was Mr. Stewart. Upon this occasion he printed his “Theorems,” which gave him a decided superiority above all the other candidates. He was accordingly elected professor of mathematics in the university of Edinburgh, in September 1747. | The duties of this office gave a turn somewhat different to his mathematical pursuits, and led him to think of the most simple and elegant means of explaining those difficult propositions, which were bit erto only accessible to men deeply versed in the modern analysis. In doing this, he was pursuing the object which, of all others, he most ardently wished to obtain, viz. the application of geometry to such problems as the algebraic calculus alone had been thought able to resolve. His solution of Kepler’s problem was the first specimen of this kind which he gave to the world, and which, unlike all former attempts, was at once direct in its method and simple in its principles. This appeared in vol. II. of the “Essays of the Philosophical Society of Edinburgh,” for 1756; and in the first volume of the same collection are some other propositions by him, which are an extension of a curious theorem in the fourth book of Pappus. In the course of prosecuting his plan of introducing into the higher parts of mixed mathematics, the strict and simple form of ancient demonstration, he produced the “Tracts Physical and Mathematical,” which were published in 1761. In the first of these, Mr. Stewart lays down the doctrine of centripetal forces in a series of propositions demonstrated, the quadrature of curves beingadmitted, with the utmost rigour, and requiring no previous knowledge of mathematics, except the elements of plane geometry and of conic sections. The good order of these propositions, added to the clearness and simplicity of the demonstrations, renders this tract the best elementary treatise of physical astronomy that is any where to he found. In the three following tracts, his object was to determine, by the same method, the effect of those forces which disturb the motions of a secondary planet: and from these he proposed to deduce, not only the theory of the rnoon, but a determination of the sun’s distance from the earth. The former, it is well known, is the most difficult subject to which mathematics have been applied. It must be regretted, therefore, that the decline of Dr. Stewart’s health, which began soon after the publication of the “Tracts” did not permit him to pursue this investigation. In regard to the distance of the sun, the transit of Venus, which was to happen in 1761, had turned the attention of mathematicians to the solution of this curious problem; but when it was considered of how delicate a nature the | observations were from which that solution was to be deduced, and to how many accidents they were exposed, it was natural that some attempts should be made to ascertain the dimensions of our system by some method less subject to disappointment. Such accordingly was the design of Dr. Stewart, and his inquiries into the lunar irregularities had furnished him with the means of accomplishing it. The transit of Venus took place; the astronomers returned, who had viewed the curious phenomenon, from the most distant stations: and no very satisfactory result was obtained from a comparison of their observations. 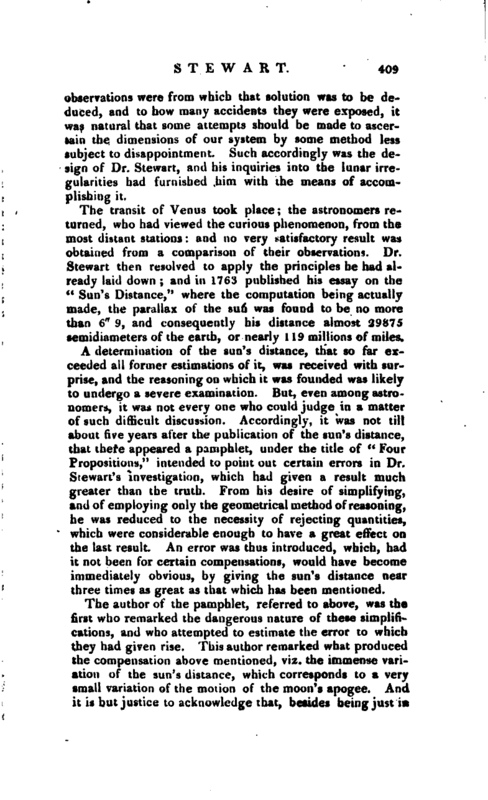 Dr. Stewart then resolved to apply the principles he had already laid down and in 1763 pnblisned his essay on the “Sun’s Distance,” where the computation being actually made, the parallax of the sun was found to be no more than 6“9, and consequently his distance almost 29,875 semidiameters of the earth, or nearly 119 millions of miles. A determination of the sun’s distance, that so far exceeded all former estimations of it, was received with surprise, and the reasoning on which it was founded was likely to undergo a severe examination. But, even among astronomers, it was not every one who could judge in a matter of such difficult discussion. Accordingly, it was not till about five years after the publication of the sun’s distance, that there appeared a pamphlet, under the title of” Four Propositions," intended to point out certain errors in Dr. Stewart’s investigation, which had given a result much greater than the truth. From his desire of simplifying, and of employing only the geometrical method of reasoning, he was reduced to the necessity of rejecting quantities, which were considerable enough to have a great effect on the last result. An error was thus introduced, which, had it not been for certain compensations, would have become immediately obvious, by giving the sun’s distance near three times as great as that which has been mentioned. The author of the pamphlet, referred to above, was the first who remarked the dangerous nature of these simplifications, and who attempted to estimate the error to which they had given rise. This author remarked what produced the compensation above mentioned, viz. the immense variation of the sun’s distance, which corresponds to a very small variation of the motion of the moon’s apogee. And it is but justice to acknowledge that, besides being just in. | the points already mentioned, they are very ingenious, and written with much modesty and good temper. The author, who at first concealed his name, but afterwards consented to its being made public, was Mr. Dawson, a surgeon at Suclbury in Yorkshire, and one of the most ingenious mathematicians and philosophers which this country at that time possessed. A second attack was soon after this made on the sun’s distance, by Mr. Landen; but by no means with the same good temper which has been remarked in the former. He fancied to himself errors in Dr. Stewart’s investigation, which have no existence; he exaggerated those that were real, and seemed to triumph in the discovery of them with unbecoming exultation. 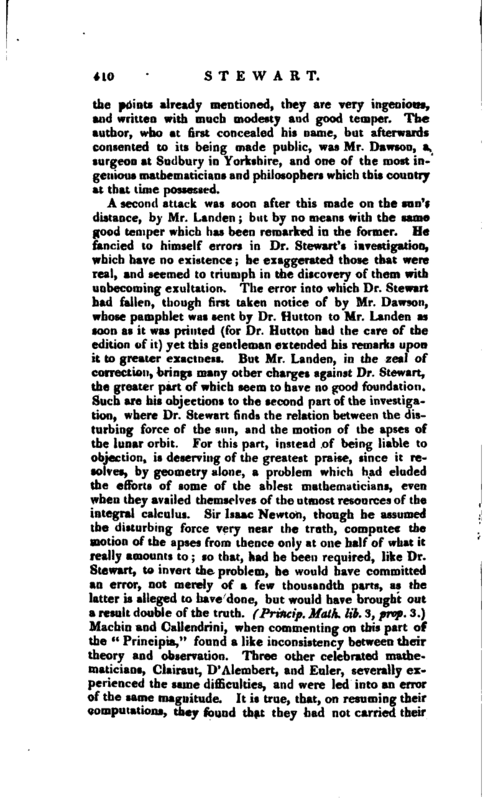 The error into which Dr. Stewart had fallen, though first taken notice of by Mr. Dawson, whose pamphlet was sent by Dr. Hutton to Mr. Landen as soon as it was printed (for Dr. Hutton had the care of the edition of it) yet this gentleman extended his remarks upon it to greater exactness. But Mr. Landen, in the zeal of correction, brings many other charges against Dr. Stewart, the greater part of which seem to have no good foundation. Such are his objections to the second part of the investigation, where Dr. Stewart finds the relation between the disturbing force of the sun, and the motion of the apses of the lunar orbit. For tiiis part, instead of being liable to objection, is deserving of the greatest praise, since it resolves, by geometry alone, a problem which had eluded the efforts of some of the ablest mathematicians, even when they availed themselves of the utmost resources of the integral calculus. Sir Isaac Newton, though he assumed the disturbing force very near the truth, computec the motion of the apses from thence only at one half of what it really amounts to; so that, had he been required, like Dr. Stewart, to invert the problem, he would have committed an error, not merely of a few thousandth parts, as the latter is alleged to have done, but would have brought out a result double of the truth. (Princip. Math. lib. 3, prop. 3.) Machin and Callendrini, when commenting on this part of the “Principia,” found a like inconsistency between their theory and observation. Three other celebrated mathematicians, Clairaut, D’Alembert, and Euler, severally experienced the same difficulties, and were led into an error of the same magnitude. It is true, that, on resuming their computations, they found that they had not carried their | approximations to a sufficient length, which when they had at last accomplished, their results agreed exactly with observation. 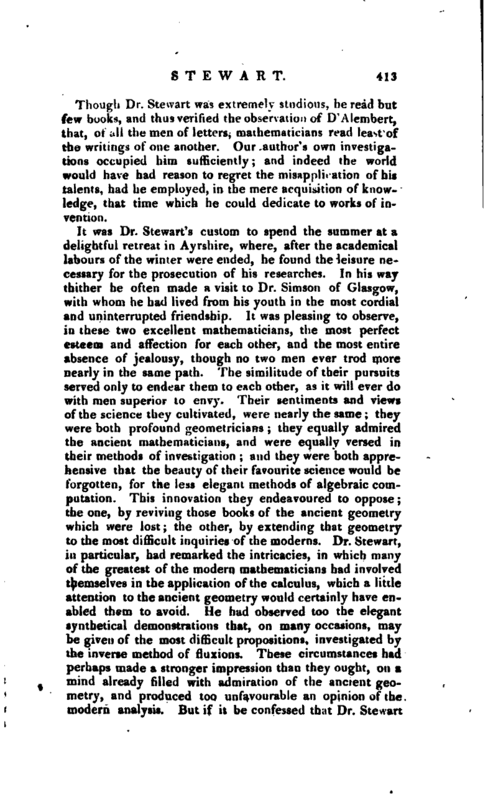 Mr. Walmsley and Dr. Stewart were the first mathematicians who, employing in the solution of this difficult problem, the one the algebraic calculus, and the other the geometrical method, were led immediately to the truth; a circumstance so much for the honour of both, that it ought not to be forgotten. It was the business of an impartial critic, while he examined our author’s reasonings, to have remarked and to have weighed these considerations. 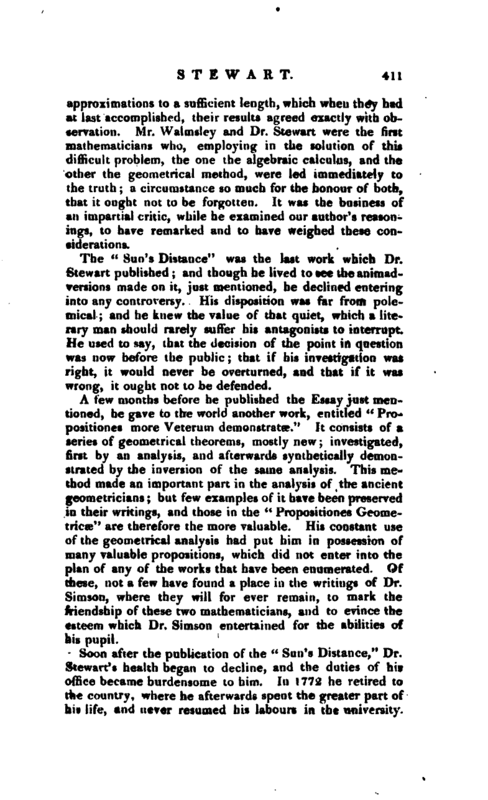 The “Sun’s Distance” was the last work which Dr. Stewart published; and though he lived to see the animadversions made on it, just mentioned, he declined entering into any controversy. His disposition was far from polemical; and he knew the value of that quiet, which a literary man should rarely suffer his antagonists to interrupt. He used to say, that the decision of the point in question was now before the public; that if his investigation was right, it would never be overturned, and that if it was wrong, it ought not to be defended. 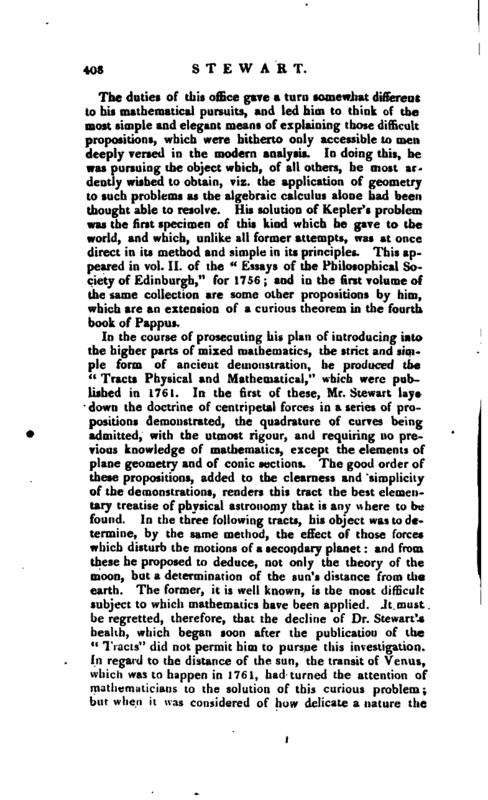 A few months before he published the Essay just mentioned, he gave to the world another work, entitled “Propositiones more Veterum demonstratae.” It consists of a series of geometrical theorems, mostly new; investigated, first by an analysis, and afterwards synthetically demonstrated by the inversion of the same analysis. This method made an important part in the analysis of the ancient geometricians; but few examples of it have been preserved in their writings, and those in the “Propositiones Geometricse” are therefore the more valuable. His constant use of the geometrical analysis had put him in possession of many valuable propositions, which did not enter into the plan of any of the works that have been enumerated. Of these, not a few have found a place in the writings of Dr. Simson, where they will for ever remain, to mark the friendship of these two mathematicians, and to evince the esteem which Dr. Simson entertained for the abilities of his pupil. Soon after the publication of the “Sun’s Distance,” Dr. Stewart’s health began to decline, and the duties of his office became burdensome to him. In 1772 he retired to the country, where he afterwards spent the greater part of his life, and never resumed his labours in the university. | He was, however, so fortunate as to have a son to whom, though very young, he could commit the care of them with the greatest confidence. Mr. Dugald Stewart, having begun to give lectures for his father from the period above mentioned, was elected joint professor with him in 1775, and gave an early specimen of those abilities which are now so universally known. After mathematical studies (on account of the bad state of health into which Dr. Stewart was falling) had ceased to be his business, they continued to be his amusement. The analogy between the circle and hyperbola had been an early object of his admiration. The extensive views which that analogy is continually opening; the alternate appearance and disappearance of resemblance in the midst of so much dissimilitude, make it an object that astonishes the experienced, as well as the young geometrician. To the consideration of this analogy therefore the mind of Dr. Stewart very naturally returned, when disengaged from other speculations. His usual success still attended his investigations; and he has left among his papers some curious approximations to the areas, both of the circle and hyperbola. For some years toward the end of his life, his health scarcely allowed him to prosecute study even as an amusement. He died the 23d of January 1735, at the age of sixty-eight. The habits of study, in a man of original genius, are objects of curiosity, and deserve to he remembered. Concerning those of Dr. Stewart, his writings have made it unnecessary to remark, that from his youth he had been accustomed to the most intense and continued application. In consequence of this application, added to the natural Vigour of his mind, he retained the memory of his discoveries in a manner that will hardly be believed. He seldom wrote down any of his investigations, till it became necessary to do so for the purpose of publication. When he discovered any proposition, he would set down the enunciation with great accuracy, and on the same piece of paper would construct very neatly the figure to which it referred. To these he trusted for recalling to his mind, at any future period, the demonstration, or the analysis, however complicated it might be. Experience had taught him that he might place this confidence in himself without any danger of disappointment; and for this singular power he was probably more indebted to the activity of his invention, than to the mere tenaciousness of his memory. | Though Dr. Stewart was extremely studious, he read but few hooks, and thus verified the observation of D’Alembert, that, of all the men of letters, mathematicians read least of the writings of one another. Our author’s own investigations occupied him sufficiently; and indeed the world would have had reason to regret the misapplication of his talents, had he employed, in the mere acquisition of knowledge, that time which he could dedicate to works of invention. By Mr. Piayfair, in vol. I. of the Edinburgh Philosophical Transactions. —Hutton’s Dictionary.